Last Friday, I got a call from Jerry Gregoire, founder of Redbird Flight and currently as retired from hard work as is possible for a person with seemingly boundless energy, which is to say, he’s not very retired at all. His current passion is the work of the Commemorative Air Force (CAF) Wing at San Marcos, Texas, and specifically working to help out in any way he can with what is clearly his favorite plane in the fleet there, a North American B-25 bomber called Yellow Rose. Jerry, who just got type rated in the B-25—congrats!—wanted to know if I’d like to go for a ride along on the plane the next day. Yes and next question. I just didn’t know how big a deal it would wind up being to me. The B-25 Mitchell bomber “Yellow Rose,” operated by the Centex Wing of the Commemorative Air Force, is one of around 25 airworthy B-25s in existence of nearly 10,000 built for World War II by North American Aviation. 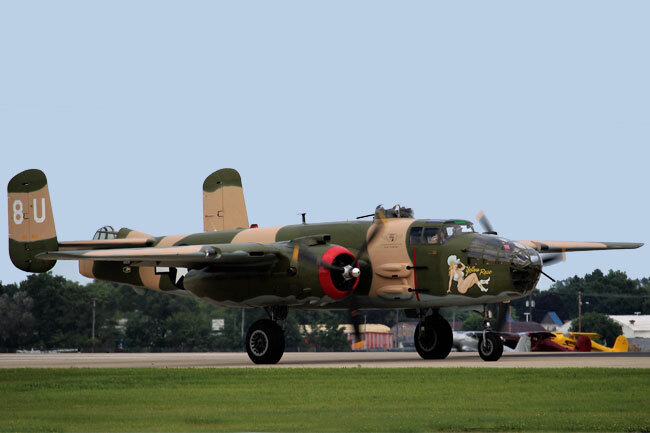 The B-25 is just one of dozens of types of warbirds kept alive and flying by the CAF. Back when the battle for the Pacific was heating up in World War II and the United States was looking to turn a defensive war into an offensive one, Lt. Col. Jimmy Doolittle and 79 other airmen took off in 16 North American B-25 bombers from the deck of the aircraft carrier Hornet and headed for Tokyo. It was April 18, 1942, just over 75 years ago, and at the time the mission seemed bold. The idea was to strike a surprise blow to the Japanese capital and give a big morale boost to the troops and the people back home by letting the enemy know that we could take the war to them. The obstacles were overwhelming. For one, the B-25, a medium bomber manufactured by North American Aviation, was never intended for carrier operations. There was barely enough room on the deck to park the 16 twins, never mind take off in them. The first to go, a B-25 piloted by Lt. Col. Doolittle, had less takeoff distance than the rest. The last to go, number 16, piloted by Lt. W.G. Farrow, had the most distance, since the deck was now empty save his plane. The flight to Tokyo and then, after dropping their bombs, to free China, would require 2,400 miles of range, and the bombers were outfitted with a variety of additional fuel tanks, almost doubling their capacity to nearly 1,200 gallons and giving them sufficient range to make the run and then escape to unoccupied China. They didn’t carry many bombs, as most of the interior space was taken up by additional fuel bays. But the point wasn’t so much to inflict damage as to send a message. Showing up overhead, uninvited and unexpected, would do just that. Over the course of the war and beyond, North American built a lot of B-25s, nearly 10,000 of them, at its California plant in Inglewood and its Kansas City, Kansas, factory. Today there are around 35 B-25s around the world, with around 25 of them in airworthy condition. But that day on the deck of the Hornet, for all practical purposes, there were only 16 of them in the world. And off they went, a few handfuls of small bombers headed over the wide, wide Pacific, toward Japan, intent on making a statement, about announcing that the United States was coming at the aggressors. All 16 bombers made it to Tokyo, and of the 80 airmen on the planes, 69 survived the mission, many of those after having been captured by the Japanese and put in concentration camps for the duration of the war. One plane landed in Siberia, but the crew was imprisoned for more than a year by the Soviets, who were still neutral at the time. Many of those who crash-landed or bailed out evaded capture and returned to the battlefield, fighting in both the Asian and European theaters. There is one surviving Doolittle Raider, Richard E. Cole, who is 102 years old. Cole was the co-pilot to Lt. Col. Doolittle. The story is an amazing one. I urge you to learn more about it, but beware, you might not be able to pull yourself away from it. 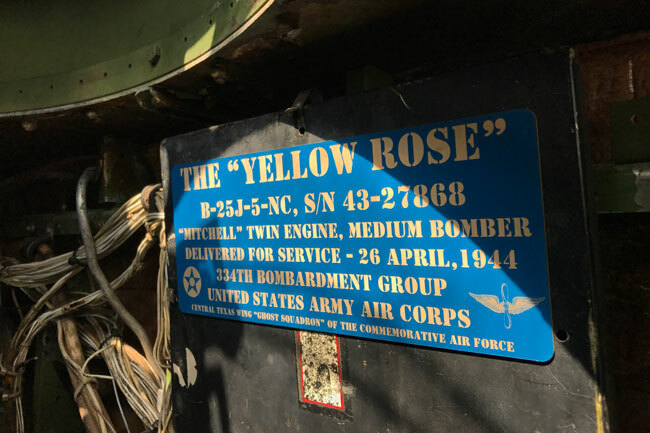 Manufactured by North American in 1943, Yellow Rose entered service in 1944, two full years after the Doolittle raid, though it never made it outside the United States, serving as a training platform for crews headed to Europe. The plane, restored by the CAF in 1981, is in great shape. One of the first impressions you get when you climb aboard is just how small it is. No doubt that B-25 crews got to know each other well on their missions. Customized placards tell first-time flyers about the type, connecting them with the remarkable history of these planes and the people who flew them. As we lifted off from San Marcos on our short trip to perform a flyover for the crowd at the nearby Circuit of the Americas racecourse, I couldn’t help but think about the young men who climbed aboard B-25s during wartime. And I thought about the young men who launched into the lonely sky that spring day in the far Pacific, and I wondered what they must have been thinking. And I thought about the countless other young men who did so in battle in every major front in World War II, where the B-25 was deployed. And when I did, I was immediately grateful, in a deep and heartfelt way, for the work that the CAF and many other groups around the country and around the world do to keep these planes in top-notch condition, and not just B-25s but hundreds of models of planes from the earliest days of military aviation to the present. Unfortunately, the future of these amazing planes is far from certain. The members of the Commemorative Air Force, and other grass roots aviation preservation associations, have seen and flown a lot of great planes. Many of them flew in combat themselves, a small number in World War II. But as the population of these dedicated aircraft restorers and pilots grows older, many have been forced by the relentless march of time to stop flying and, eventually, to no longer be able to assist in the restoration and maintenance of these great birds. So there’s opportunity for younger pilots and aviation enthusiasts of every variety. The San Marcos Chapter is actively looking for people to join in on their mission. They need pilots, people with mechanical expertise and even people who just want to help in any way that they can. Membership is not expensive, and the money goes toward one of the best causes I can think of. Find out more by visiting the CAF website, commemorativeairforce.org. With the deadline for equipping with approved ADS-B gear just two years out now, it’s time not only to equip but to equip before it’s too late. By the last six months—and most likely by the last 12 months—of the time remaining, the wait for getting ADS-B gear installed in your plane could be impossibly long. And the larger and more valuable your plane is, the more you have to worry about it. If the laws of supply and demand have taught us anything, it’s that the more leverage businesses have to increase their prices, the more likely they are to do that. So if you think shop time is expensive now, just wait until June of 2019 to see how much it costs, if you can schedule and install before the end of the year at all. GAMA recently came out with an announcement that a milestone had been achieved: 40,000 planes have now equipped with ADS-B gear. Hooray? There are probably around 150,000 aircraft that will need the gear by the deadline if they want to keep flying as they do now. For turbine aircraft, well, every one of them that flies over 18,000 feet, which is the vast majority of them, will need it. Time hasn’t run out for them, but that time isn’t too far in the future. The same is true for all of us, no matter what size our planes. With few exceptions, equipping with ADS-B is going to be a fairly major job. The good news is that there is real opportunity for us owners of light GA planes. For those of you, like me, who are looking to get some cool new gear installed in your older airplane, do not fail to put in ADS-B gear at the same time as you do the other upgrade. As you know if you’ve done any panel work, pulling everything apart and then putting it all back together again represents a sizable chunk of the shop time required to do any job. If you’re going to be doing major panel work, by all means do it all at the same time to save yourself what could be a lot of dough in the long run. 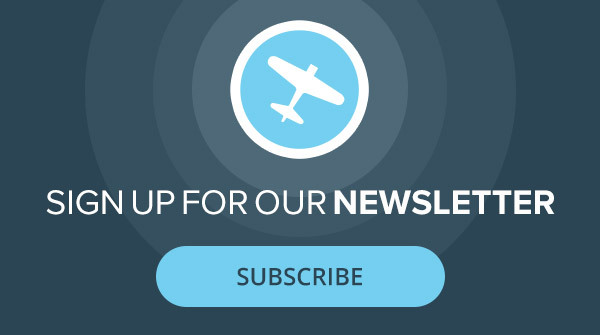 Because you’re going to want to get some of these amazing new avionics, including autopilots, and you’re going to have to get ADS-B equipped, like it or not. My dad was a tail gunner on a B-24. I enjoyed your blog post today!